In 1991, the Texas Low-Level Radioactive Waste Disposal Authority (TLLRWDA) began searching for a disposal site for dangerous toxic waste in the Hudspeth County area. According to the 1983 La Paz agreement, Hudspeth County falls in a no-contamination zone surrounding the Mexican border. Regardless, the TLLRWDA selected Sierra Blanca, a small low-income town in an environmentally fragile region. In 1992, local Bill Addington responded by forming the foundation “Save Sierra Blanca,” which opposed the establishment of the disposal site and rallied support among the primarily Spanish speaking population, who did not have access to information about disposal. In 1992, Texas agreed to dispose of nuclear waste from Maine and Vermont in exchange for $55 million, which caused outrage in the local group. The group then allied with the Nuclear Responsibility Network to form the Sierra Blanca Legal Defense Fund (SBLDF). On 5 June 1996, the SBLDF dispatched five hundred children from Acuna, Mexico, along with their parents, mayor, and city council members to Austin to protest the establishment of the disposal site to Governor George W. Bush. The campaigners marched, and conducted a sit-in and a vigil. By August 1997, seven hundred people in Sierra Blanca (almost everyone in the town) signed a petition against the establishment of the waste site. Twenty other Texas counties, as well as ten cities and two Mexican states had passed resolutions against the disposal of nuclear waste in their jurisdictions as well. Addington and his supporters led a demonstration at an El Paso community college, competing for attention with a rally for George W. Bush. At the demonstration, the SBLDF members carried banners, while Addington and several others also donned costumes with nuclear symbols on them. The protest gained enough media attention to attract the notice of Merco Joint Venture, the corporation who the TLLRWDA had contracted for disposal. Merco retaliated against the SBLDF by burning Addington’s lumberyard, submitting his property to surveillance, and even at one point threatening his life. On 16 September 1997, the U.S. House of Representatives stopped the Texas-Vermont-Maine compact in a vote of 243 to 176. This marked the first time nuclear disposal had even been debated as a possibly negative solution. Governor Bush wanted the compact reintroduced; his forces combined with that of the nuclear lobby made sure it was passed when next voted on in 1997. When President Bill Clinton signed the bill into law, Addington and allies went directly to the media. Sources such as the Washington Post and the New York Times reported on the “environmental racism” of the Sierra Blanca case. 60% of the town’s residents were poor and Latino, yet the compact and the TLLRWDA’s environmental report had not been translated into Spanish and distributed. The state department had already been receiving pressure from the Mexican government, and the negative American press did not help. On 16 April 1998, several months before the Texas Radioactive Waste Bill was set to go before Congress, Mexico’s Green Ecologist Party announced that several of its members and the Mexico City councilman Jose Luis Rodriguez began a 24-day hunger strike. They spent the duration of the strike on the bridge between Juarez, Mexico, and El Paso, Texas. They carried letters of protest from Mexican Congressmen, which pointed to the violation of the La Paz Treaty. 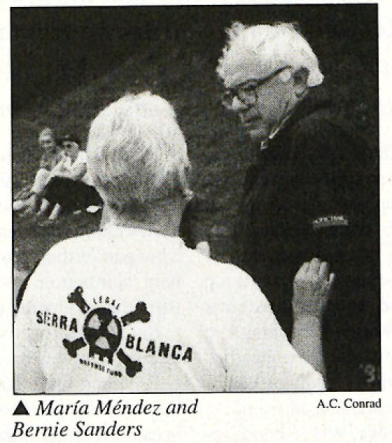 On 11 May 1998, twelve Sierra Club activists met with Vermont Representative Bernie Sanders, but he would not denounce the bill. In response, the campaigners marched on Governor George W. Bush’s home in protest of the upcoming bill. There was no response from the governor. On 26 July 1998, three hundred Mexicans and Americans blockaded the Juarez-El Paso bridge in protest of the bill. That same month, the SBLDF sent two representatives to an environmental rally in Vermont to speak on behalf of their community. Campaigners from Vermont were so inspired by the SBLDF representatives that they staged protests at a nearby nuclear plant. The Citizens’ Awareness Center and the Nuclear Information and Resource Center supported and organized these protests. Although the bill passed on 20 September 1998, Texas officials denied the necessary licensing for the establishment of a disposal site in the Sierra Blanca region due to vast social pressure ignited by the SBLDF and their partners. The project was officially shut down by the State of Texas on 22 October 1998. "Bill Addington Interview." Interview by David Todd and David Weisman. Briscoe Center for American History. University at Texas, Austin, 28 Mar. 2001. 25 Feb. 2011. .
"Environmental Justice Case Study: The Struggle for Sierra Blanca, Texas Against A Low-Level Nuclear Waste Site." University of Michigan. 25 Feb. 2011. .
"Proposed Sierra Blanca Radioactive Waste Dump Fact Sheet." 25 Feb. 2011. .
Schafran, Alex. "Sierra Blancans Fight Toxic Dump in Border Town." Network News: National Network for Immigrant and Refugee Rights (NNIRR). 25 Feb. 2011. .
"Texas Regulators Vote Against Sierra Blanca Nuke Waste Dump." Livestock Weekly. 25 Feb. 2011. .
Tokar, Brian, and Gary Oliver. "The Texas-Vermont-Maine Nuclear Dump: Bringing Environmental Racism Home." ZMagazine. 25 Feb. 2011. .